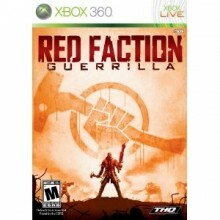 After a rather long wait and plenty of hype, THQ’s “Red Faction: Guerrilla” is finally being released in the very near future. Today, I bring you my personal first impressions based on the demo, which goes live April 23. The opening: A decent movie-style trailer plays before you jump to the title screen, which explains a little bit about the main character, Alec Mason and what we can expect from the story. It’s more or less a stage-setting preview, but it gets the job done and I definitely felt compelled to play the game after watching the whole thing. The user interface: Menus are extremely simple to navigate and once you’re used to the basic in-game control scheme, everything is very easy to access. The demo doesn’t allow much access to all of those menu options, but rest assured that it’ll be quite simple to navigate if it’s anything like the demo version. The controls: For the most part, this game uses a standard third-person control scheme, but the weapon swapping is somewhat different, as is the aiming. These days, most games opt for a left trigger aiming system, while this game uses the right joystick’s button to bring up the more accurate zoomed in aiming system. To compare it to another recent game, it’s a lot like the aiming system used in “Saint’s Row 2”. And on that note, the camera is very easy to control and seems very fluid. As for the weapon swapping, simply hold down the right button and hit the proper face button to switch your equipped weapon. So far, I like the controls. Let’s hope they turn out as smooth in the final product! The graphics: The visual quality is a mixed bag, but all-in-all, it’s impressive for what it is. The developers chose a high frame rate that maintains a high degree of fluidity over high-end visuals. Textures, character models, particle effects, lighting, shadows; it’s all there and it’s still pretty damn appealing, but there’s a good amount of jagged edges and it’s very obvious that the game just doesn’t look as stellar as other games in the genre. Still, it’s hard not to appreciate a game that looks this good and still maintains a solid high frame rate and so long as the final product maintains that framerate throughout the entire game, I wont have any complaints. Plus, the biggest thing here is the potential mass amount of destruction that you, the player can cause on the environment. Most things can be destroyed and it looks pretty realistic when buildings fall or when bricks crumble. It’s a step in the right direction, to say the least. The sound: There’s a generic electronic beat throughout the demo level, but it’s less of a song and more of an atmospheric tone. It fits the game perfectly, but I still wish there were a bit more to it. That could be a personal thing, though. Weapons all sound standard, but powerful. Voice acting is pretty damn good, too. To round the package out, the sounds that fly through your ears as you lay waste to buildings, walls and opponents is like a symphony of destruction. The gameplay: The whole package comes together rather nicely and the game is really fun to play. For that matter, you can easily replay the demo a few times just for the hell of it because it’s so damn fun. In the demo, the general idea is to simply move from point a to point b while laying waste to everything in your path. There’s also a crate at the start of the demo mission that allows you to swap your weapons out and refill ammo, as well as an odd currency system based on collecting remnants of destroyed objects and trading them in for supplies. Despite that, ammo is in no short supply and the range of your weaponry is fantastic even without the currency system. I’m not sure if the demo just gives you stuff to play around with or if the game will allow you to be this powerful for real, but the demo gives you a ton of remote bombs, which is probably the most enjoyable part of the demo itself. Running around and planting a few bombs, only to walk to a high-up view and set the charges off for a beautiful display of destruction is something that must be experienced. I can be easily entertained at times, but to be honest, it’s little things like this that are going to set this game apart from the rest. Even if the final product really does turn out far worse than this awesome demo, the developers can stand proud and say that they were the first to create environments that can be destroyed to this extent on a home video game console. That right there will make this game go down in history, if nothing else. Kudos for that, guys! I look forward to playing this game when it’s released on June 9, 2009.